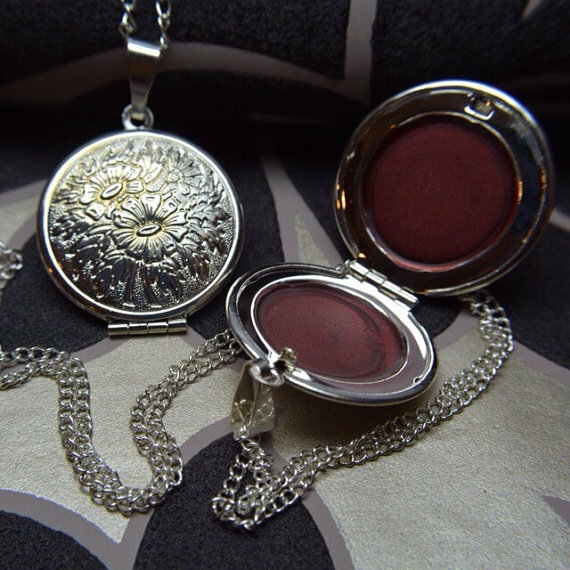 Keep your favorite lip tint close to your heart with this unique, vintage silver plated locket! Inside you will find a silky, subtle, 100% natural, titan maroon tinted lip balm. Cocoa butter, coconut oil & honey are delicately blended for their ultra moisturizing and anti-aging properties while vanilla and orange caress the olfactory sense making truly kissable lips! This balm also doubles as a cream blush just in case you are feeling cheeky! Now available on ﻿Etsy﻿! 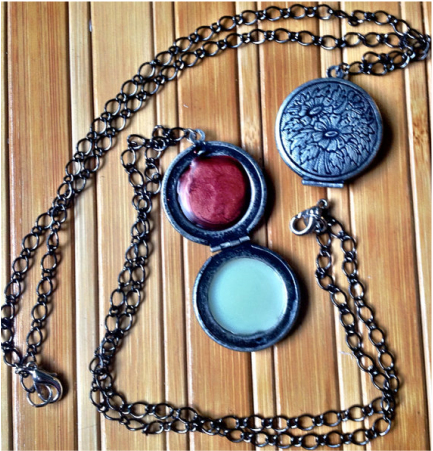 Now you can have your favorite lip tint & solid perfume close to your heart with this unique, vintage silver plated locket! Keep your lips ultra moisturized and young while enjoying the fresh aroma of spring year round with this ultimate combo! Getting Lippy Tint on one side, Lilac & Honeysuckle solid perfume on the other! Caress the olfactory sense while having truly kissable lips! The lip tint also doubles as a cream blush just in case you are feeling cheeky! Now available on Etsy! The perfect gift idea for that special someone! 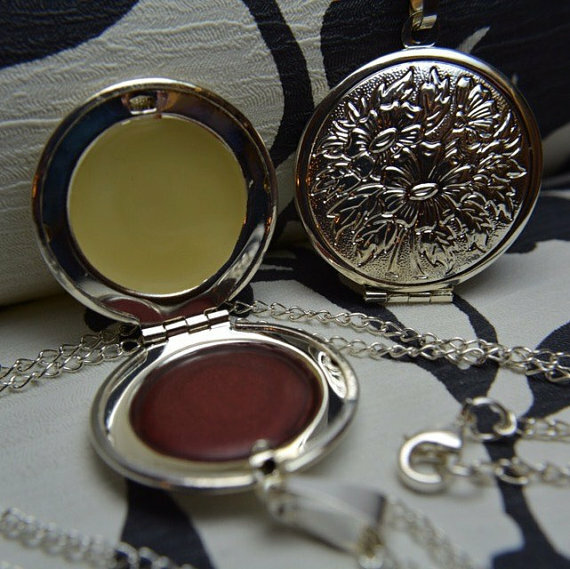 Keep your favorite scent close to your heart with this gorgeous, unique locket! Delight in the fresh scent of spring year round with a luxurious blend of lilac & honeysuckle! This romantic combination is known for it's uplifting, aphrodisiac & antidepressant qualities. Made with only the best natural ingredients. 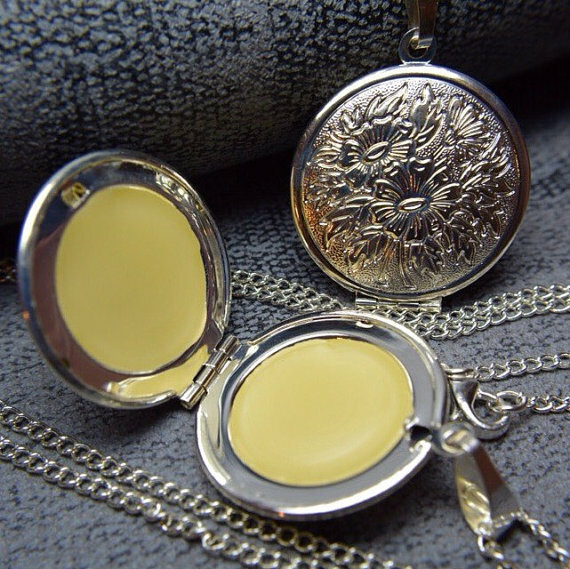 When you run out of perfume this gorgeous sterling silver plated locket & 17in. sterling silver plated chain with lobster clasp can be cleaned & used for photos or mementos. Express delivery is available at an extra charge to ensure delivery before Christmas. Available on Etsy!